Because the ARS blades are specially hardened, it takes a tough stone to sharpen them. This specially designed sharpening stone is made of carborundum and shaped to help file the ARS pruner and hedge shear blades. This sharpening file is designed specifically for ARS tri-edge saw blades. The file is angled in such a way that 2 surfaces can be filed simultaneously. Filing instructions included, or can be downloaded here: Filing Instructions. 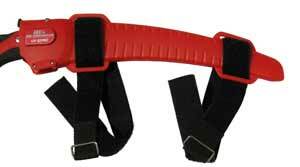 GT Tension Leg Straps keep the PRO Series saws tight around your leg for instant and easy access when climbing.